The countries of the world agreed today to work together in 2016 to use the Montreal Protocol to eliminate the global warming contribution from one of the six main greenhouse gases by phasing down refrigerants called hydrofluorocarbons, or HFCs. A long list of details are scheduled to be negotiated during a series of meetings next year, both at an extraordinary Working Group meeting and an extraordinary Meeting of Parties. The Montreal Protocol is the only UN treaty where all 197 countries of the United Nations participate. Many parties including the U.S., Mexico, Canada, island States, and the 54 countries of the Africa Group wanted to move faster with the details this week, but Gulf States and India demanded delay on details until after COP 21 in Paris next month, raising a red flag about their tactics in Paris. If there's a silver lining to this slow deliberation, it's that the parties will be able to implement a strict phase down schedule much faster than usual. The market for superior substitutes is on the march and will be sweeping up the slow-moving companies. As Jeem Lippwe, Deputy Permanent Representative of the Federated States of Micronesia to the United Nations, who led his country's delegation said, "After seven years of efforts, we have at last agreed to amend the Montreal Protocol next year to phase down HFCs. This is a significant win for the climate system and for the momentum of multilateral climate cooperation heading into Paris." Phasing down HFCs will provide climate mitigation up to 100 billion tons of carbon dioxide equivalent by 2050 and avoid up to 0.5C of warming by 2100. This will be a major contribution to the world's efforts to keep temperatures from passing 2C above pre-Industrial levels, beyond which potentially irreversible and catastrophic climate impacts are expected. The world's temperature has already risen by nearly 1C. The Montreal Protocol is widely considered the world's best environmental treaty. It has already phased out nearly 100 chemicals that were damaging the stratospheric ozone layer, while also providing the most climate mitigation of any treaty, the equivalent of 135 billion tons of carbon dioxide. Its success has avoided $1.8 trillion in health care costs, according to Achim Steiner, Executive Director of the UN Environment Programme, in his remarks yesterday at the opening of the high-level segment of the negotiations. 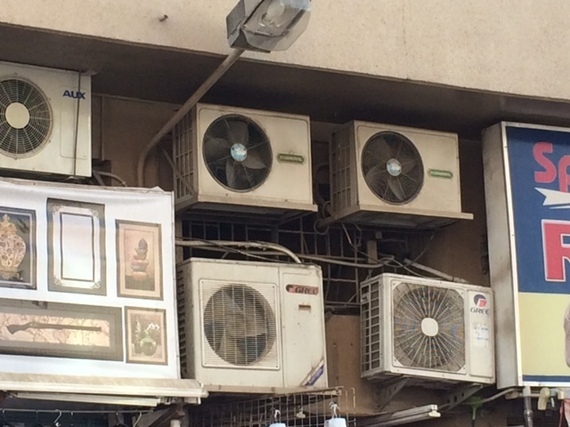 The past phase-outs of refrigerants also has catalyzed improvements in the energy efficiency of the air conditioners and other appliances using the refrigerants, often by 30 to 60%. Improving efficiency of room air conditioners could save enough energy to avoid building up to 2,500 medium-size power plants by 2050, according to Lawrence Berkeley National Laboratory in California. (There are currently 2,300 coal-fired power plants in the world.) This would avoid the equivalent of up to an additional 100 billion tons of carbon dioxide by 2050, while also saving money for consumers.